Son of Amminadab; descendant in the fifth generation from Judah and brother-in-law of Aaron (Ex. vi. 23; I Chron. ii. 4-10). Nahshon was appointed by Moses, upon God's command, as prince of the tribe of Judah, and though his tribe was fourth in the order of the Patriarchs, yet at the dedication of the Tabernacle he was the first to bring his dedicatory offering (Num. i. 7; ii. 3; vii. 12, 17; x. 14). Nahshon was, through Boaz, the ancestor of David (Ruth iv. 20-22; I Chron. ii. 10 et seq.). Owing to his direct descent from Judah and to his being the progenitor of so many kings, Nahshon is extolled by the Rabbis as a most noble man. 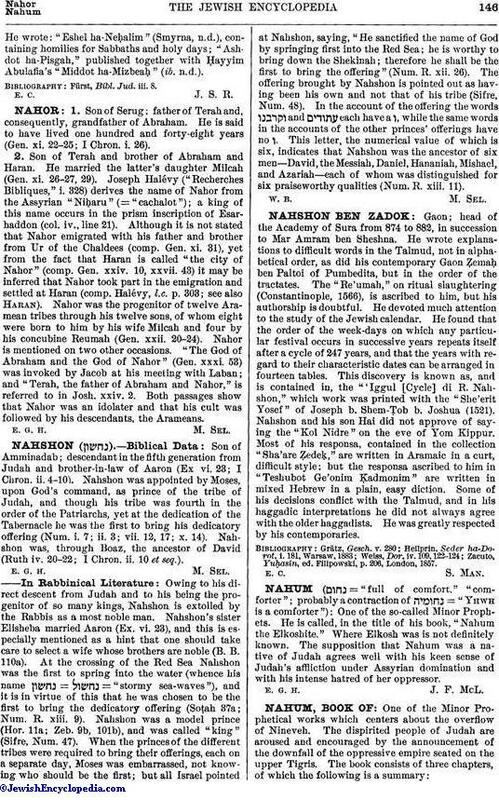 Nahshon's sister Elisheba married Aaron (Ex. vi. 23), and this is especially mentioned as a hint that one should take care to select a wife whose brothers are noble (B. B. 110a). At the crossing of the Red Sea Nahshon was the first to spring into the water (whence his name = "stormy sea-waves"), and it is in virtue of this that he was chosen to be the first to bring the dedicatory offering (Soṭah 37a; Num. R. xiii. 9), Nahshon was a model prince (Hor. 11a; Zeb. 9b, 101b), and was called "king" (Sifre, Num. 47). When the princes of the different tribes were required to bring their offerings, each on a separate day, Moses was embarrassed, not knowing who should be the first; but all Israel pointed at Nahshon, saying, "He sanctified the name of God by springing first into the Red Sea; he is worthy to bring down the Shekinah; therefore he shall be the first to bring the offering" (Num. R. xii. 26). The offering brought by Nahshon is pointed out as having been his own and not that of his tribe (Sifre, Num. 48). In the account of the offering the words and each have a ו, while the same words in the accounts of the other princes' offerings have no ו. This letter, the numerical value of which is six, indicates that Nahshon was the ancestor of six men—David, the Messiah, Daniel, Hananiah, Mishael, and Azariah—each of whom was distinguished for six praiseworthy qualities (Num. R. xiii. 11).